After you beat a game like Mass Effect 2, Apple wants to send you a comic book that re-tells your unique videogame story. Have you ever thought that the way you completed a game was so cool it was worthy of being in print? 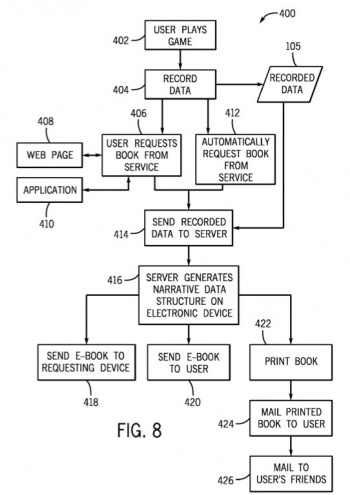 Apple thinks so too, with a recent patent filed by the company that will generate a book based on the recorded data from a videogame called "Automatically Generating a Book Describing a User's Videogame Performance." The way it works is quite simple. A consumer plays a videogame and then requests a book to be made. Information recorded in the game is sent to a server, which generates "narrative data" and transcribes it into a book, e-book, or comic book. This could likely include pregenerated text and images, or screenshots that take the place of illustrations. The platforms mentioned for use with this technology are mobile phones, videogame consoles, handhelds, and personal computers. This might not be all that useful for a game like New Super Mario Bros. Wii, but with an expansive game like Mass Effect or Fallout 3 where choice is a key mechanic it could create vastly different books for each person. The patent names Mass Effect specifically to point out how the technology would work, with each of the game's dialog choices referred to as one of the differences the system would record and then print. The resulting book would also feature the type of character that a player created with his/her specific looks, character class, etc. This isn't anything that's going to revolutionize gaming but it is a clever thought. As personal choice becomes a larger part of many videogames, it might be cool to have a reminder of how we completed a game in the past. Even better, emergent gameplay could lead to emergent books. And you never know, with mod tools like Fallout 3's G.E.C.K. now prominent, we might someday be able to create our own books/comic books simply by playing through our own creations.